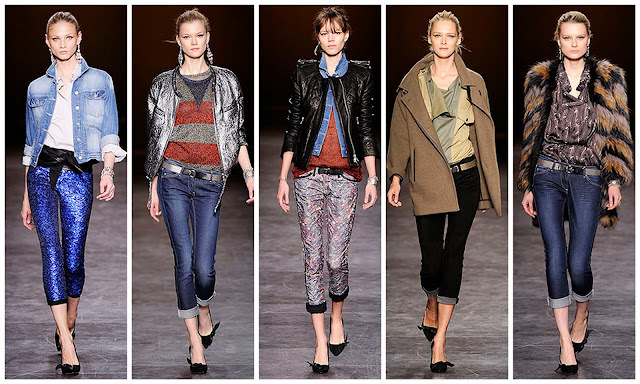 Ooh la la.....I am really loving Isabel Marant's glam sequin pants and effortless layers from the F/W 2010 collection. The textures of fur, sheers, sequins, and silk are all so rich without being stuffy. Denim adds the perfect touch and makes it great for daytime without being over the top. If only I could call every piece in the collection mine.....le sigh. mais le agree! sparkles galore make for happy days & nights! I love the jacket on the fifth one to the right! love those looks, I want those sequin pants!! The sequin pants for sure, and the middle ones with the black cuffs.